I thought I'd share with you my photos from the challenge I talked about last week. I already shared Day 1 in the linked post so here are Days 2 - 6 for your visual delight! 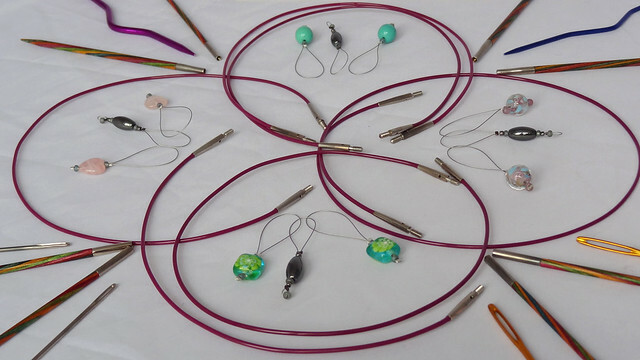 For this I simply emptied out my big bag of knitting tools and started making pretty patterns. It was a really overcast day so I used my pop-up light tent. I do think it gives me a fair chance at getting a reasonable picture, even on dark days! The choice for this photos was actually pretty easy to make. I dug my blanket out of storage this week as it has been rather chilly, and have been huddled underneath it whilst surfing the web. This blanket had never been photographed in it's finished state because I wanted to block it and that has been impossible to do. It needs pinning out on blocking boards outside in warm weather, as we have no inside area big enough that doesn't need using over a few days in Winter. This picture of an old FO is actually the reality of how our knits are after the "pretty as a picture" photo shoots we try to do for our blogs and project pages. 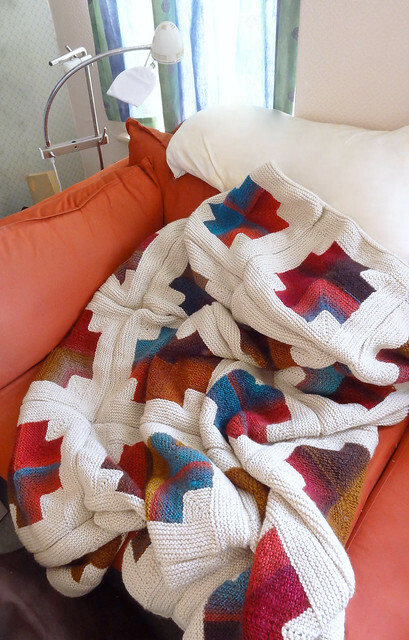 I love that it is a picture of a blanket that is being used in it's intended manner, to keep me snug. It has been on my bed all week too! As our weather forecast told me it would snow on Saturday afternoon I decided to try and wait until the snow came to take my photos. We haven't had any snow yet this Winter and I thought snow would offer a nice image. It got to around 3pm and the snow started to come in tiny little specks. I decided to go out and start snapping. It didn't start to really come down heavily until after dark. In the end, the best image I captured was this one, and you can hardly see the snow at all. The photo is of a wooden railing that runs around the side of the raised platform upon which our summerhouse resides. The railing is covered in trailing ivy, which I love. 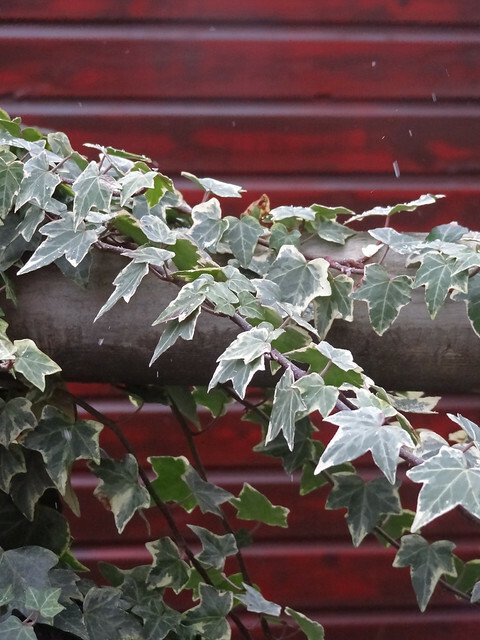 I really like the way the summerhouse provides a rich, deep background for the paler railing and ivy. This one was a tough one, so soon after doing Craft Tools. I should have read ahead, and realised this would happen, and chosen a different subject for my tools photo - maybe a sewing machine or something. But as I didn't read ahead I was a bit more restricted than I originally hoped I would be. So, I took a photograph of my felted purse that houses all my notions, that are tiny and easily lost. 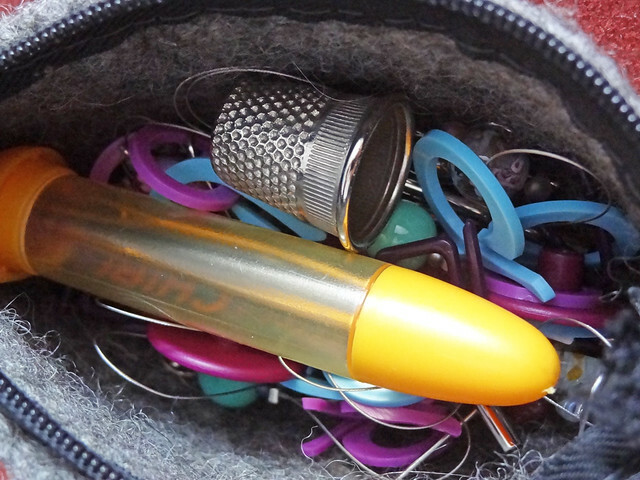 This purse has proved invaluable since I first made it. The pattern can be downloaded for free by clicking on the Downloads tab. It's a great way of using up odd balls of yarn, left over from a project. In the end, I like how the photograph came out. 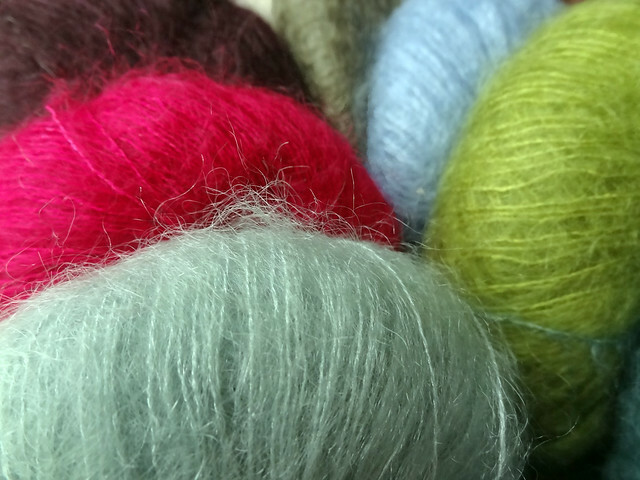 Lots of jumbled up stitch markers with pops of colour, against the fuzzy grey felted fabric. I loved today's subject. Colour is so important to all crafters. Colour is one of the main driving forces in creating each project. The subject matter of today's photo seemed pretty obvious to me. I'm currently working on my Tribute Wrap, which involves using 9 different skeins of Rowan Kidsilk Haze. This is a very decadent project that was only made possible by receiving a very generous gift of yarn from a bereaved mother, who is friend of my Mum. Every colour change on this project brings me such joy as I plunge my hand into a bag of glorious yarn in delicious hues. All I did for this photograph was line up all the yarn and start snapping. I think nothing more needs to be said except - YUM! This project of taking a photograph every day is challenging, but not in an overwhelming way. I am enjoying having a topic to focus me on taking photographs each day. It is giving me a reason to really get to grips with my new camera and also with Photoshop, which I got just before Christmas. This is exactly what I wanted - a way of focusing my attention on my photography. As always, when I went outside, the neighbour's cat came to see what I was up to. He is the friendliest little thing and always wants a fuss. He kept following me around to see what I was taking photographs of. 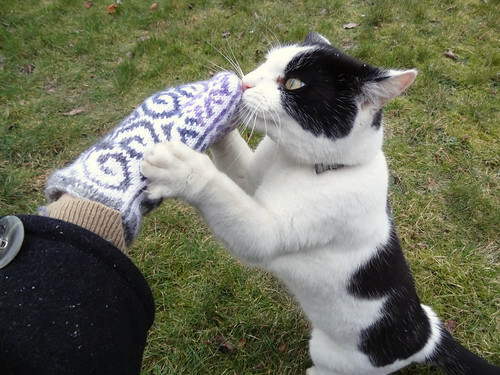 I went to stroke him and he decided that he needed to check out my new mittens - he obviously is a fan of quality knitting! I think he wanted to keep it.